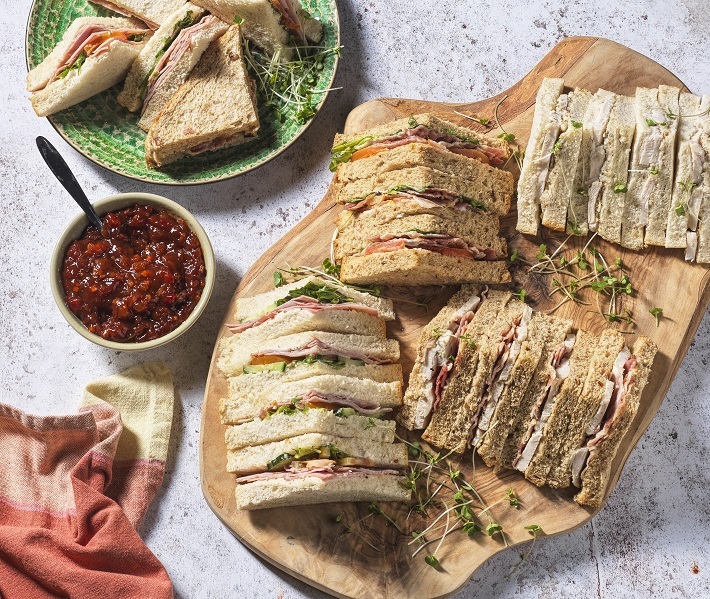 This 20 piece meat sandwich selection includes Chicken & Bacon, Chicken & Stuffing, BLT, Beef & Horseradish and Smoked Ham & Mustard sandwiches. Meat sandwich platter consisting of 4 quarters of chicken and bacon sandwich, 4 quarters of BLT sandwich, 4 quarters of chicken and stuffing sandwich, 4 quarters of smoked ham and mustard sandwich and 4 quarters of beef and horseradish sandwich. Malted Bread (Fortified Wheat Flour (Wheat Flour, Calcium Carbonate, Iron, Niacin, Thiamin),Water, Malted Wheat Flakes, Wheat Bran, Wheat Gluten, Yeast, Salt, Malted Barley Flour, Emulsifiers: Mono- and Diglycerides of Fatty Acids, Mono- and Diacetyl Tartaric Acid Esters of Mono- and Diglycerides of Fatty Acids; Spirit Vinegar, Malted Wheat Flour, Rapeseed Oil, Flour Treatment Agent: Ascorbic Acid; Palm Fat, Palm Oil, Wheat Starch), Chicken Breast (25%) (British Chicken Breast, Salt, Cornflour), Maple Cured Smoked Bacon (10%) (British Pork Belly, Maple Syrup, Salt, Sugar, Antioxidant: Sodium Ascorbate; Preservative: Sodium Nitrite), Black Pepper Mayonnaise (10%) (Water, Rapeseed Oil, Cornflour, Spirit Vinegar, Pasteurised Free Range Egg Yolk, Sugar, Pasteurised Free Range Whole Egg, Salt, Black Pepper, Concentrated Lemon Juice, Mustard Seeds), Lettuce, Butter (Cows' Milk). White Bread (Fortified Wheat Flour (Wheat Flour, Calcium Carbonate, Iron, Niacin, Thiamin),Water, Salt, Yeast, Wheat Gluten, Spirit Vinegar, Emulsifiers: Mono- and Diglycerides of Fatty Acids, Mono- and Diacetyl Tartaric Acid Esters of Mono- and Diglycerides of Fatty Acids; Rapeseed Oil, Flour Treatment Agent: Ascorbic Acid; Palm Oil, PalmFat, Wheat Starch), Chicken Breast (25%) (British Chicken Breast, Salt, Cornflour), Pork Sage and Onion Stuffing (11%) (British Pork, Fortified Wheat Flour (Wheat Flour, Calcium Carbonate, Iron, Niacin, Thiamin), Water, Onion, British Pork Fat, British Pork Rind, Rapeseed Oil, Salt, Sage, White Pepper, Parsley, Yeast), Water, Rapeseed Oil, Cornflour, Spirit Vinegar, Pasteurised Free Range Egg Yolk, Sugar, Pasteurised Free Range Whole Egg, Salt, Concentrated Lemon Juice, Mustard Seeds. Oatmeal Bread (Fortified Wheat Flour (Wheat Flour, Calcium Carbonate, Iron, Niacin, Thiamin),Water, Oatmeal (Oat Gluten), Wheat Bran, Yeast, Salt, Wheat Gluten, Spirit Vinegar, Emulsifiers: Mono- and Diglycerides of Fatty Acids, Mono- and Diacetyl Tartaric Acid Esters of Monoand Diglycerides of Fatty Acids; Rapeseed Oil, Malted Barley Flour, Palm Oil, Flour Treatment Agent: Ascorbic Acid; Palm Fat, Wheat Starch), Oak Smoked Formed Ham with Added Water (35%) (British Pork, Water, Salt, Stabiliser: Sodium Triphosphate; Antioxidant: Sodium Ascorbate; Preservative: Sodium Nitrite),Water, Dijon Mustard (3.5%) (Water, Black Mustard Seeds, Spirit Vinegar, Salt), Rapeseed Oil, Cornflour, Spirit Vinegar, Pasteurised Free Range Egg Yolk, Sugar, Pasteurised Free Range Whole Egg, Salt, Concentrated Lemon Juice, Mustard Seeds. Malted Bread (Fortified Wheat Flour (Wheat Flour, Calcium Carbonate, Iron, Niacin, Thiamin),Water, Malted Wheat Flakes, Wheat Bran, Wheat Gluten, Yeast, Salt, Malted Barley Flour, Emulsifiers: Mono- and Diglycerides of Fatty Acids, Mono- and Diacetyl Tartaric Acid Esters of Mono- and Diglycerides of Fatty Acids; Spirit Vinegar, Malted Wheat Flour, Rapeseed Oil, Flour Treatment Agent: Ascorbic Acid; Palm Fat, Palm Oil, Wheat Starch), Maple Cured Smoked British Bacon (18%) (British Pork Belly, Maple Syrup, Salt, Sugar, Antioxidant: Sodium Ascorbate; Preservative: Sodium Nitrite), Tomato (17%), Lettuce (8%), Water, Rapeseed Oil, Cornflour, Spirit Vinegar, Pasteurised Free Range Egg Yolk, Sugar, Pasteurised Free Range Whole Egg, Salt, Concentrated Lemon Juice, Mustard Seeds. White Bread (Fortified Wheat Flour (Wheat Flour, Calcium Carbonate, Iron, Niacin, Thiamin),Water, Salt, Yeast, Wheat Gluten, Spirit Vinegar, Emulsifiers: Mono- and Diglycerides of Fatty Acids, Mono- and Diacetyl Tartaric Acid Esters of Mono- and Diglycerides of Fatty Acids; Rapeseed Oil, Flour Treatment Agent: Ascorbic Acid; Palm Oil, Palm Fat, Wheat Starch), Medium Rare Beef (27%) (British Beef, Water, Salt), Horseradish Sauce (10%) (Water, Single Cream (Cows' Milk), Spirit Vinegar, Sugar, Rapeseed Oil, Dried Horseradish, Pasteurised Free Range Egg Yolk, Cornflour, Salt, Mustard Flour, Horseradish Powder), Rocket, Lettuce, Water, Rapeseed Oil, Cornflour, Spirit Vinegar, Pasteurised Free Range Egg Yolk, Sugar, Pasteurised Free Range Whole Egg, Salt, Concentrated Lemon Juice, Mustard Seeds. Safety: Although every care has been taken to remove all bones, some may remain.